When the Washington Nationals agreed to terms with one of the top prizes of the MLB offseason, signing closer Rafael Soriano to a two-year deal, it caught nearly everyone in the baseball world by surprise. Storen saw the news online and immediately called his good friend and roommate, Tyler Clippard, who happens to be the other closer the team already had in the fold. The conversation was short and speculative as neither player really had a lot of information about the signing, they knew as much as anyone else. I mean, it’s easy to forget that baseball players are real people. But stuff like this is a reminder that, sure, they are. You read some crazy news on Twitter that impacts your life, you totally pick up the phone and call a friend. I have no larger point to make, just that reading this makes me like Storen and Clippard. That is all. 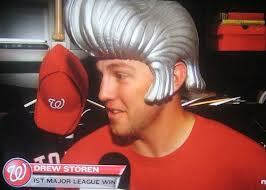 We hoped you liked reading Drew Storen and Tyler Clippard Are Real People by Jeremy Blachman! They’re good guys. I don’t know offhand if Storen reads NotGraphs, but he has been described as “cerebral” by Bob Carpenter and has looked at his PITCHf/x data on Brooks Baseball if I recall from his interview with David Laurila.